The rules are the same, the game is the same, and the opinion is the same. Ole Miss defensive end C.J. 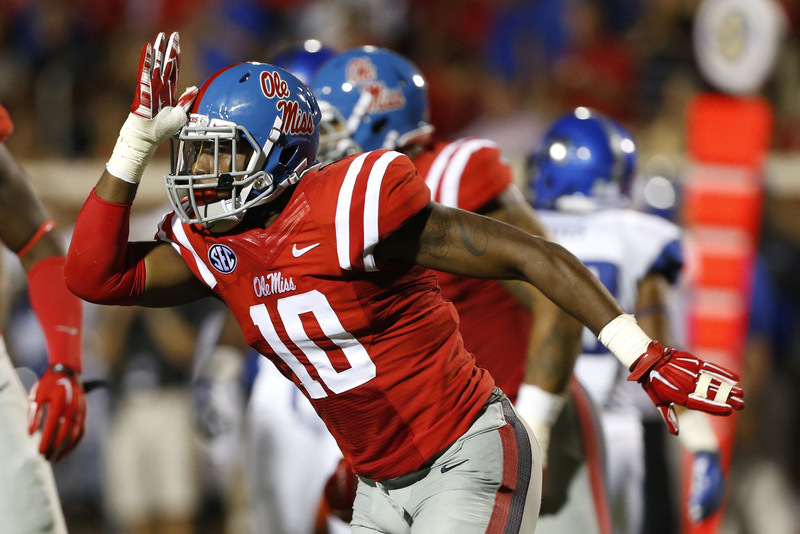 Johnson throws up the landshark after a sack during Saturday’s game against Memphis. One of the top looks according to many publications. The helmet design could certainly be a little more sleek. The cursive “Ole Miss” on the helmet is only pretty good. I do, however, love the grey pants and the color scheme. There are few jerseys better than the Rebels’ red home options. The red paired with the grey pants always looks great. The road uniforms are nice and the addition of the white jersey with blue numbers was a big plus. The all-navy option is better than most monochrome options. I did not like the red jersey paired with the blue pants (the Rebs debuted that look once last season). The powder blue helmets (worn against Memphis) were incredible These helmets were paired with the red home jersey and the grey pants. 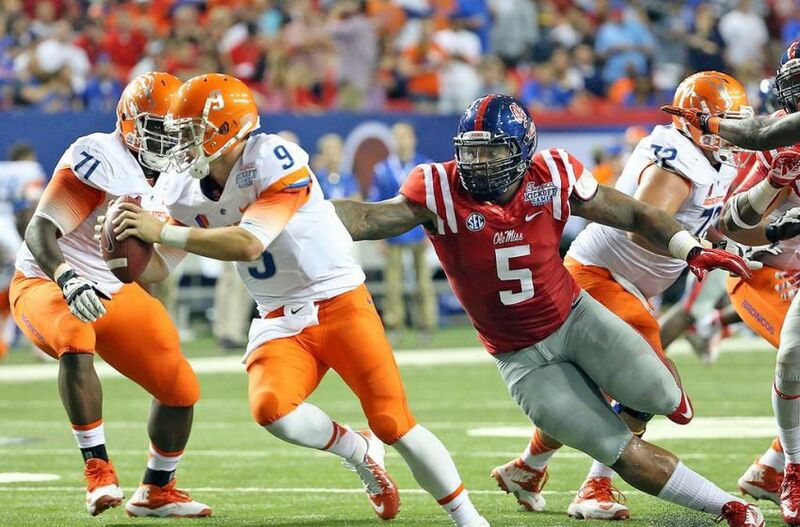 Ole Miss changed their uniform template after the 2012-2013 season and the results have been quite good. The colors are bold and they can be a bit divisive for some fans. 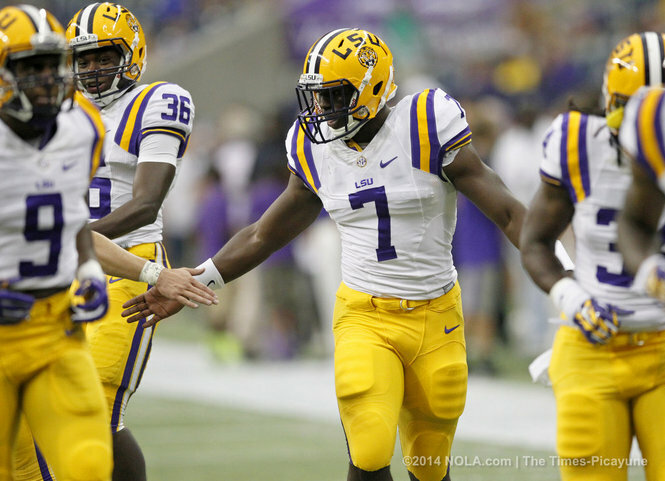 The Tigers use the same shoulder striping and primary pants design as Ole Miss. I don’t think the uniforms are quite as good as they used to be, the striping on the shoulders improved the Rebels’ look but doesn’t look quite as good on LSU. The shorter stripes might’ve been better. I would like to see the purple jersey used quite a bit more. I can’t put them higher since they basically only use their road uniform all the time. 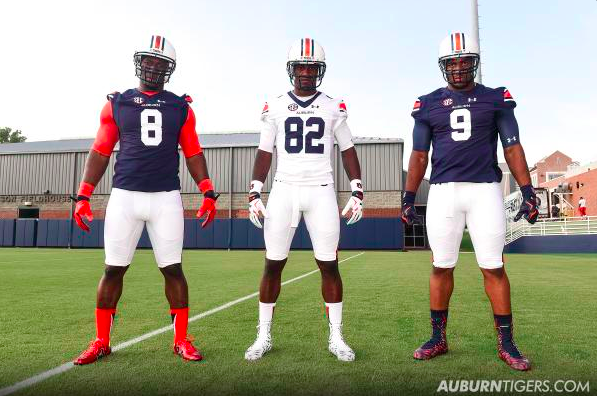 The Tigers uniforms are definitely one of Under Armour’s best looks. I would have had them below Texas A&M before this summer. They did a template switch and added several other tweaks this year. The details make all the difference sometimes. I really like the addition of the orange undershirts with the blue jerseys. This looks fantastic. I hope that the entire team will adopt the same undershirt, sock, and cleat color for each game this year. The navy options will look excellent with the road uniform. There is always the rumor of an orange jersey or a pair of blue pants for the Tigers. I don’t believe these things will happen any time soon. The Tigers will also debut a helmet with chrome accents this season. The facemask is also a chromed out this season. The Tigers are making an effort to accentuate their classic look and I approve of the moves to do so. The helmets are so good. The Aggies have maroon helmets, jerseys, and pants that are all the same shade. They are the measuring stick for all teams who use maroon. I just can’t get these bizarre alternates out of my mind. 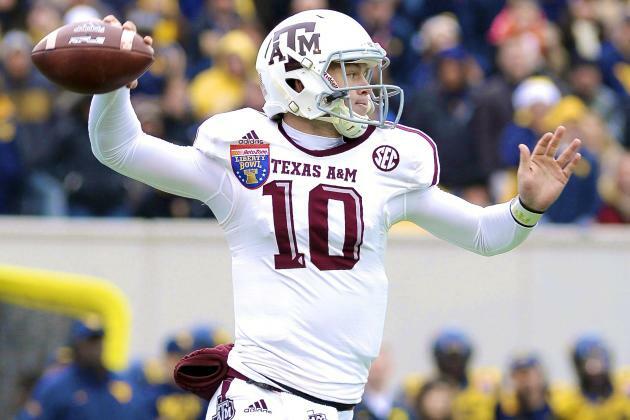 I can’t help but think of the weird alternate used against LSU in Manziel’s final season. The helmet was incredibly good looking but the monochrome pewter color was odd. 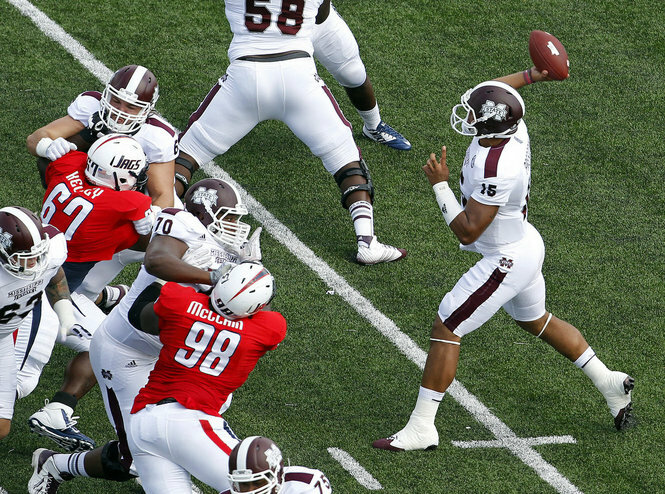 The all-white and chrome uniforms against Mississippi State last year made the Aggies’ loss no surprise. It is difficult to win games when you look like you are going to ride a snowmobile and attempt to capture James Bond. 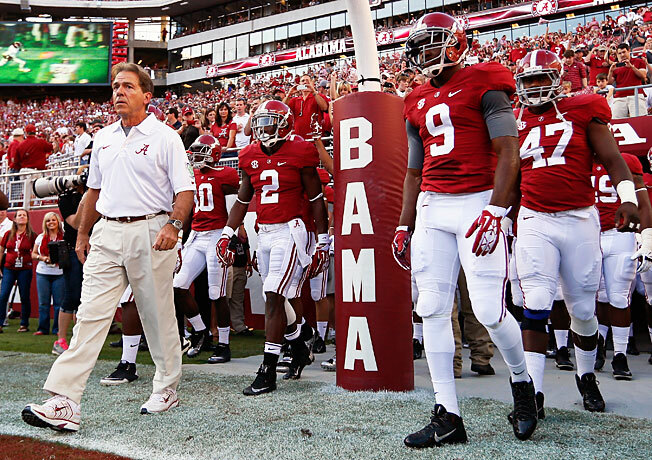 Alabama has a traditional look and the uniform has not changed since dinosaurs roamed the earth. I think their modern template gives them a sleek look when they wear their white uniforms. I think the tradition of these threads is what really carries their score. A white helmet with crimson numbers would be a great change of pace (and I do believe that Alabama had a white helmet at one point and possibly for many years). I think crimson pants would be too much to ask for. The use of grey undershirts is unique. 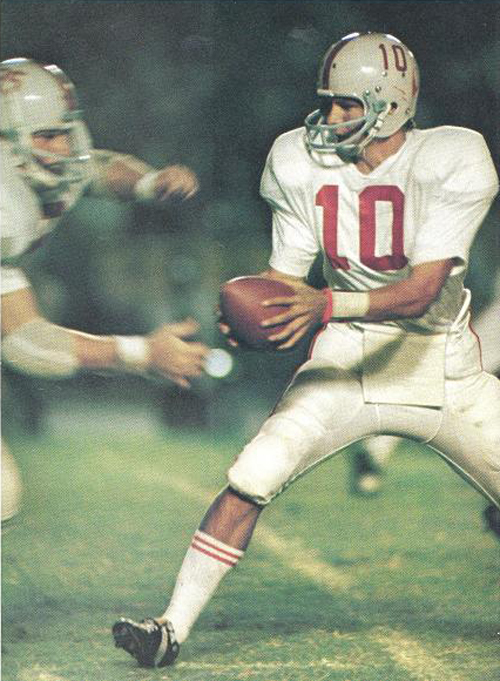 Alabama also will occasionally wear white undershirts. 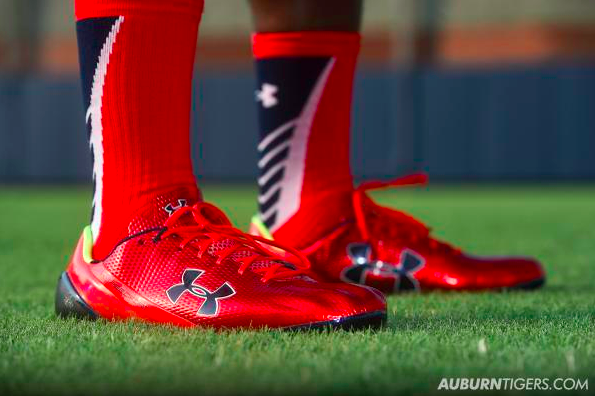 The black cleats are an odd choice since I’m sure Nike would provide Alabama with their own custom cleat design. In all, the uniform is a pretty good one. I can’t score it any higher than this because beyond tradition and a somewhat cool undershirt, these uniforms are just not as good as they could be. I love the helmet decals. I really like the traditional helmet and the white lids with the chrome decals. I just can’t award these any more points because they have been altered and redesigned so often in the last few years. The grey uniforms and helmets were a disaster. The numbers with fading colors were awful. I can’t just forget these bad uniform decisions. 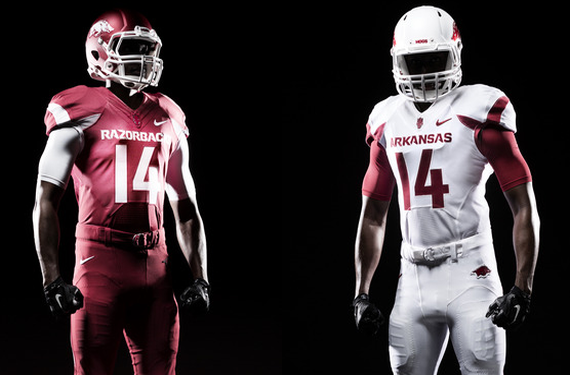 The throwback uniform worn last season against Alabama was cool and I like the Razorbacks alternate logo. I think the shoulder striping and design has been bad for several years (the razor design was worse than these new tusk things). The Bulldogs suffer from having a maroon helmet that looks like it’s shiny brown in night games. Their jerseys are maroon that have a little purple in them. It’s a shame because they don’t really have anything different in their color scheme than Texas A&M does. 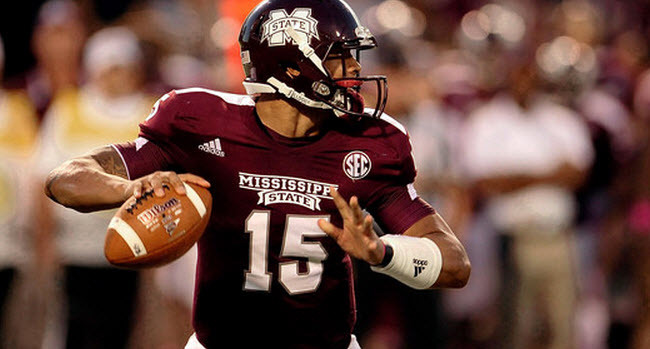 I liked Mississippi State’s grey pants and the “Hail State” across the chest on the alternates was a kind of cool. I would not be surprised if the Bulldogs tweaked their look at some point soon. 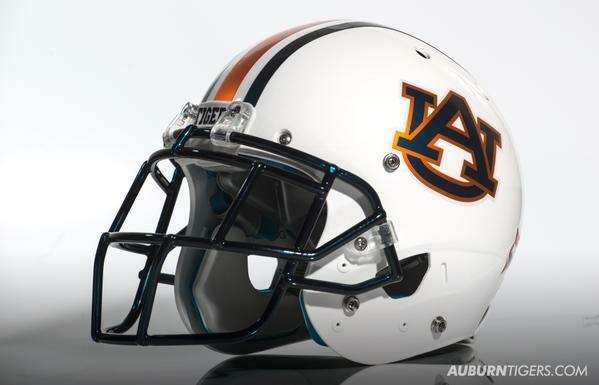 Adidas has better templates and better (read: simpler) helmet designs out there. The helmets with the bulldog overlay were actually quite cool. I think the biggest problem is that the logo is just odd and the shades of maroon are inconsistent.